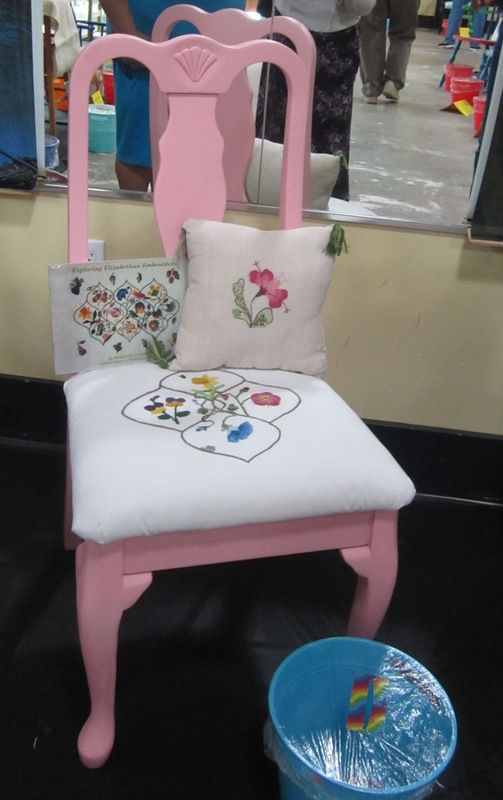 Finished chair with embroidered seat and pillow. The chair embroidery is adapted from the cover design. Happily the chair is finished and turned into the library's Char-ity event! It has been an interesting journey and I have learned so much. Why never buy a $8.00 chair? 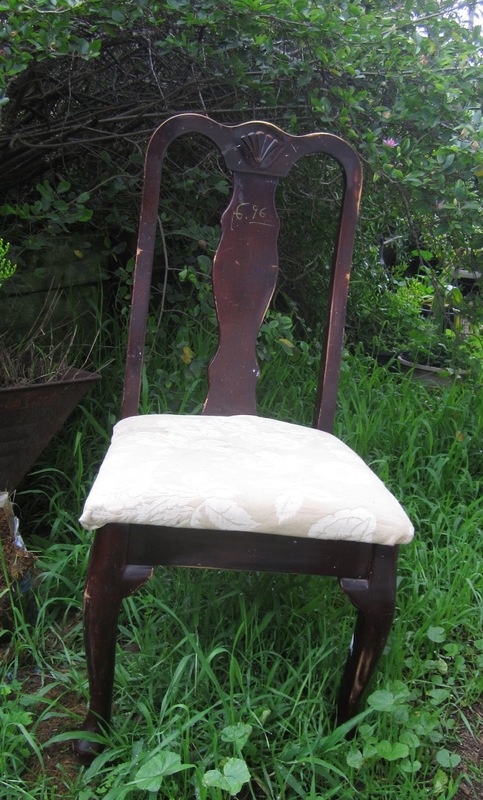 As might be expected the lower cost of the chair turned into more work. We did sit on the chair and it was really strong so I thought "this is it!" But now I've come to realize that there are other concerns like stripped screws holding the seat to the chair, damaged upholstery, and removing the chair's finish. So next chair I will be pickier! One of the happiest experiences from the project was rereading the book, "Exploring Elizabethan Embroidery" by Dorothy Clarke and designs by Stephanie Powell. When I first gave my opinion of the book I had not realized how fascinating and inspiring the book truly is. When I first started to read the "Exploring Elizabethan Embroidery" I didn't understand why so many of the stitches were just variations of the chain stitch. Now I realize that the chain stitches fill an area very fast. Also some of the needle weaving stitches save thread and don't weaken the fabric with hundreds of pokes with the needle. It all started with the dissolution of the monasteries. There was no longer as much church embroidery and many embroiderers lost their employment. 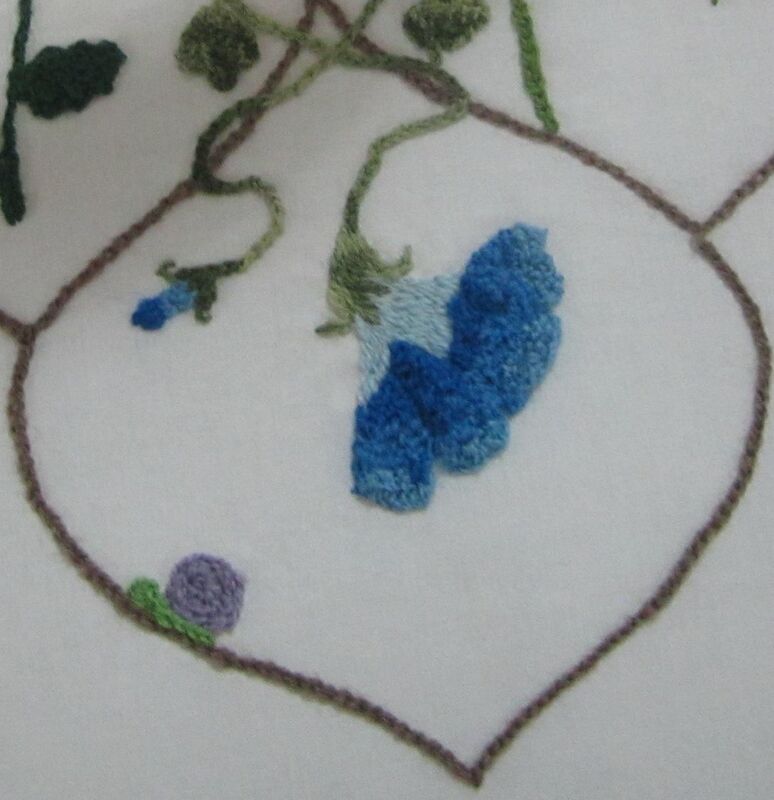 So embroiders started to work more on clothing and household goods. Faster and more durable stitches helped this new wave of embroidery. 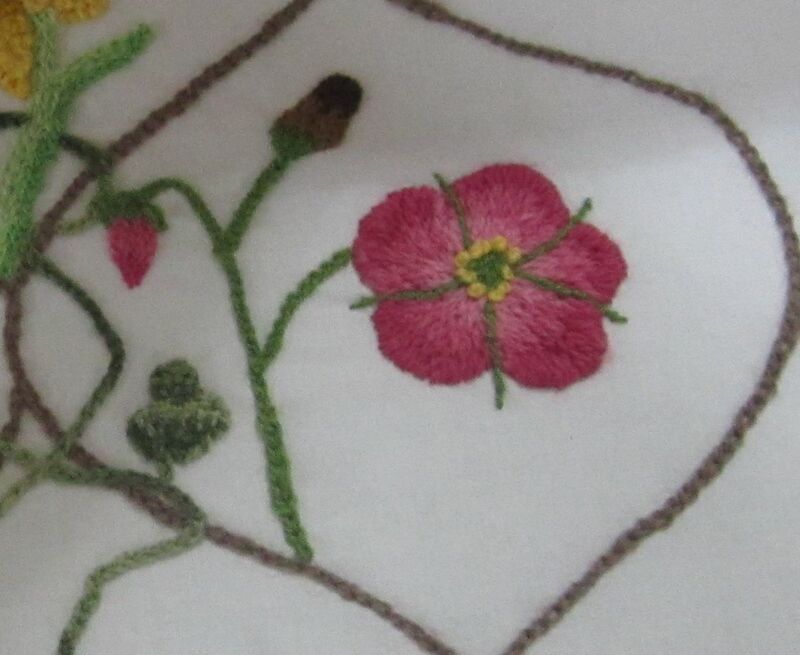 You can't make a living spending most of your life embroidering one dress! There are also some interesting effects when using buttonhole stitches to needle weave. If you needle weave enough buttonhole stitches in an area it causes the embroidery to become dimensional. Stuffing material can be added before closing your work making a firm bump on the fabric. For strength the chair seat embroidery is made of tapestry wool and stitched on a heavy cotton fabric. I kept the dimensional aspect of the embroidery low because it will be sat on . The rose was stitched first using a simple needle painting technique which makes the rose flat on the fabric and requires lots of stitches causing many stitch holes in the fabric. There was also an issue with wrinkles caused by the needle painting technique. So I decided to try the needle weaving technique on the next part which was the pansies. 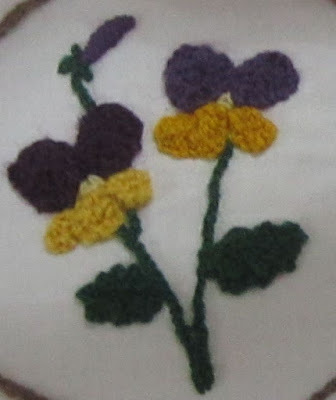 Finished pansies using buttonhole needle weaving technique. You can see how the pansies jump off the chair background. this was a chair seat I didn't actually stuff the needle weaving before closing the stitches. The way that the needle weaving was done was to first outline each section, i.e. petal, with a chain stitch in the color wool to be used in the needle weaving. Then starting at the top you work a detached buttonhole stitch in each chain stitch until you reach the other side of your shape. Then you work down one chain stitch and work detached buttonhole stitch back across the shape and into the first row. You work back and forth using more or fewer stitches so that you match the shape. More detached buttonhole stitches will cause the dimensional effect and can be padded if desired. When you get to the bottom of the shape you close the embroidery by working in the bottom chain stitches. Fewer detached buttonhole stitches may be needed to make the embroidery flatter. 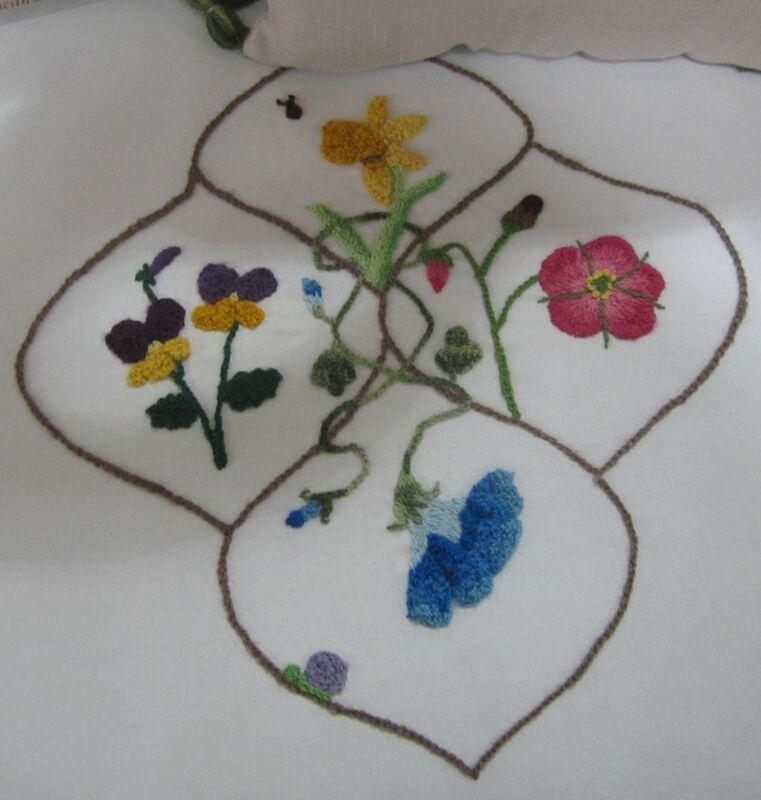 Morning glory with more buttonhole stitches making the embroidery more dimensional. For the morning glory I adapted the design to include detached buttonhole stitch and more complex shading. I really love this but it looks less like an Elizabethan embroidery. Still I really love it and chose a morning glory so it could vine through the other designs. For the vine I used a variegated green wool thread. 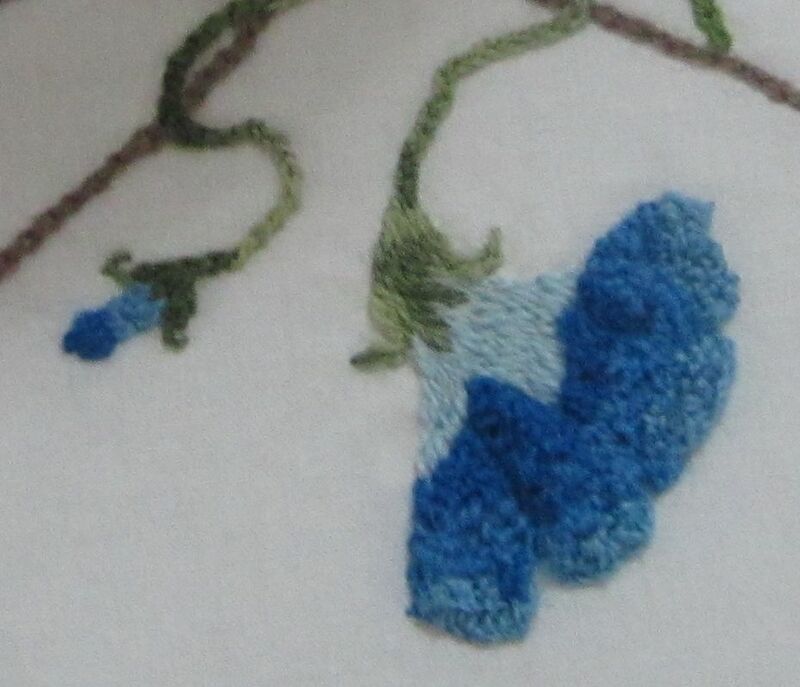 Close-up of morning glory embroidery. 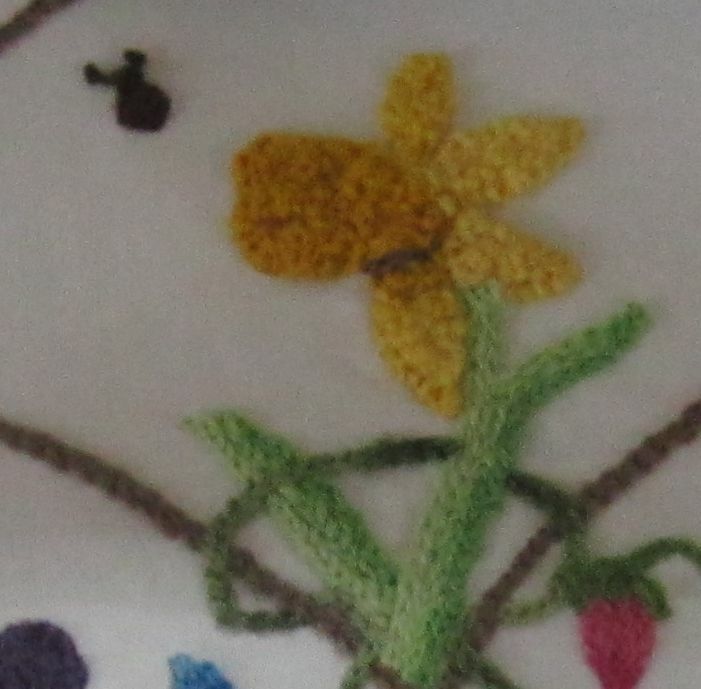 The daffodil was the final embroidery. I had more fun with this flower. 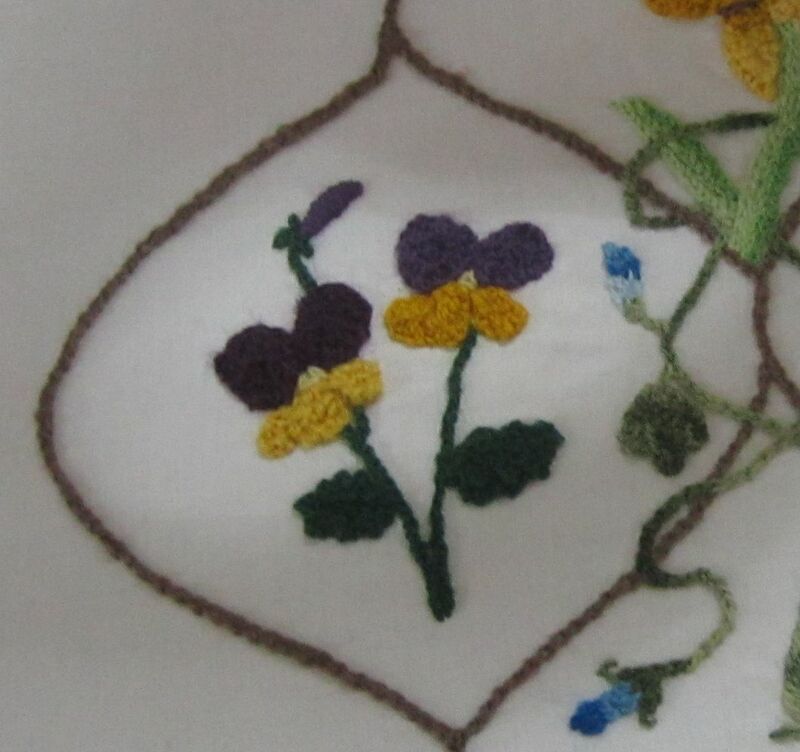 The petals and cup are in detached buttonhole stitch with simple shading. The stem is made in several colors of green in a chain stitch. Then to give it some dimension I had the vine stitched behind the stem, making the daffodil pop to the front. I added a snail and a bug and was finished! The embroidery was so quick and easy it took less then a week! The hardest part of the project was to sand and paint the chair. I had every intention of painting leaves on the chair but it just didn't look right. I also found that the paint I used on the chair wouldn't let me paint acrylics over it. The leaves just washed right off. 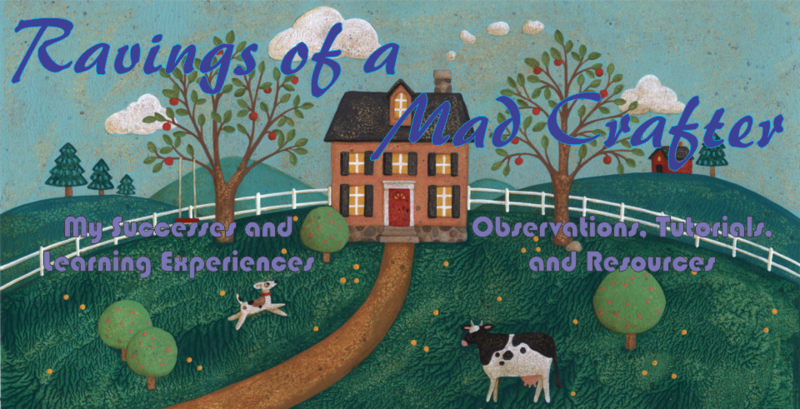 So I learned a lot from this project and I hope it brings money for the library. The pillow is actually a Jacobean design but I don't think anyone will notice! Since making the chair I have decided to make some chairs for myself. We only have office chairs in the house and some wooden chairs would be nice. I have been thinking of painting each chair a different color and embroidering the seats in different styles! I hope that this inspires you to try your hand at Elizabethan embroidery and maybe even entering a Chair-ty event in your area.